Manchester United strengthened their hold on first place in the Premier League with a 10th straight victory, beating visiting Blackburn 2-1 Saturday although Roque Santa Cruz ended United's record run of 14 league games without conceding a goal, Wayne Rooney and Cristiano Ronaldo scored to take the defending champions to 62 points - eight more than Liverpool, who host Manchester City on Sunday. Chelsea moved above Aston Villa and into third place after Nicolas Anelka scored in the 19th minute at Villa Park to give Guus Hiddink a victory in his first match as manager. Fifth-place Arsenal failed to take full advantage of Villa's slip up when they drew 0-0 with visiting Sunderland for a third straight scoreless draw in the Premier League. 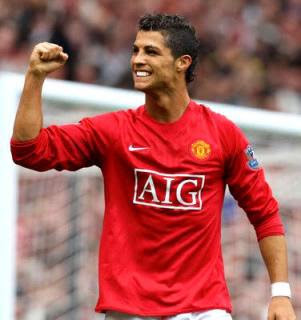 Blackburn had just come close to a 2-1 lead at Old Trafford when Ronaldo, who had moments earlier received a yellow card for diving, struck a curling free kick into the far corner, that 60th-minute goal took his season tally to 12 in the Premier League. "We gave away a really bad goal when you consider the way we defended the past 10 weeks," United manager Alex Ferguson said. "They made it a real fight for us. Sometimes when you don't play your very best you get a result like that and go on to win the title." Rooney had put United ahead in the 23rd minute, scoring in his fourth straight Premier League game for the first time, but Santa Cruz made it 1-1 nine minutes later when he took the ball past the goalkeeper and slipped it into the net from an acute angle. United, though, started with reserve 'keeper Tomasz Kuszczak, so first-choice Edwin van der Sar can still stretch his British record of 1,302 minutes without conceding. United defender Jonny Evans appeared unlucky to have a first-half header ruled out because of a push in the area and Blackburn almost took the lead in the 59th when Keith Andrews hit the post and Kuszczak smothered a follow-up shot by Ryan Nelson to ensure United stay undefeated in the league since Nov. 8. "What happened today is a good reminder that we have to fight for our lives," Ferguson said. This week turned out well for United. Now we have a seven point lead at the top, and look quite comfortable. Considering the games we have got to go, we *should* keep that lead and stay on top.